Peel and cut the melon into bite-sized cubes, scoop out the melon flesh from the top half using a scooper, and stuff with the salmon tartar. Finely chop the chives. In a bowl, add the ricotta, lime zest and chives, mix thoroughly. 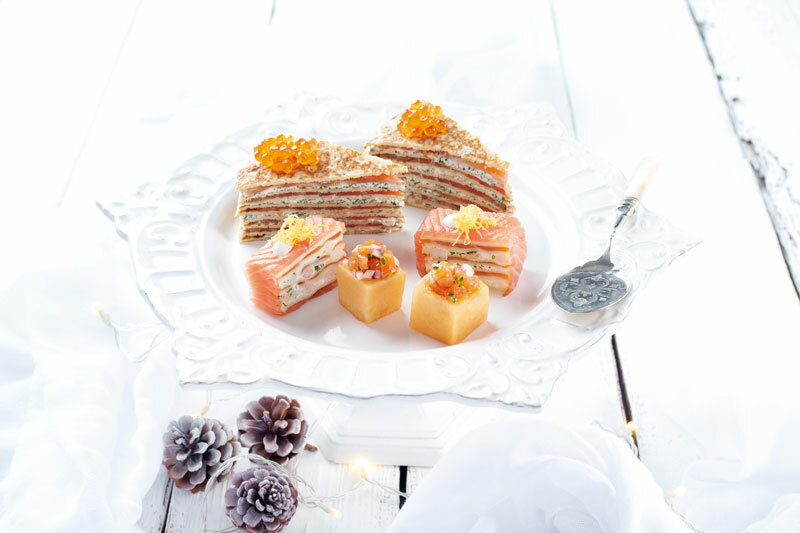 To assemble, start with a crêpe and add a spread of ricotta and layer of two slices of smoked salmon. Top with another crepe add the ricotta and smoke salmon and so on, and garnish with salmon roe. Store in the refrigerator 1 hour before serving. Chop the prawn tails and the hard-boiled egg, place these ingredients into a bowl, then add the mayonnaise and mix thoroughly, if necessary, add salt. 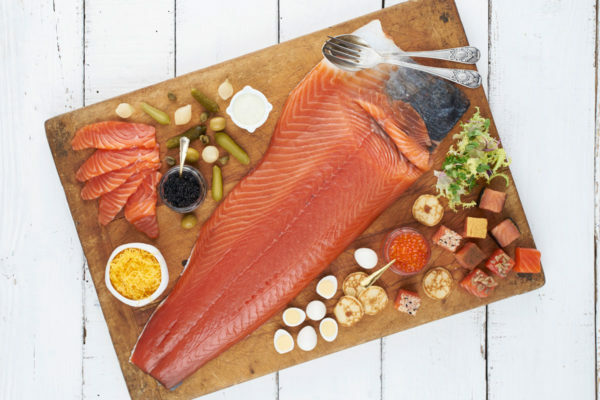 Spread out the bread and add smoked salmon until it is completely covered, add another slice and spread on the prawn salad, top with another slice and cover it with the smoked salmon, layer with bread and cover the salmon, garnish the egg yolk garnish. So that the sandwiches can be cut easily, freeze first.